God knows how long I've been asking Him for one and He finally caved in.. He said I was very very very very determined that it was useless to say No..
i'm sure my mom is probably fuming mad seeing how I got God to grant me this early birthday present... teehee.. I am officially not coveting anything at all... well except for another lens and a flash which would probably cost me so much more than a trip to the MAC store... reality check please. practically needs to visit Shen. I'm still groping around for controls and what not. My friend, Z is helping me out, teaching me about apertures and shutter speeds etc.. But I need helluva lot of practice. I got this not knowing anything at all about dslr's. 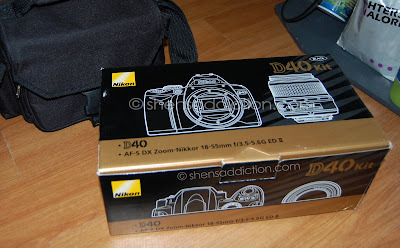 Nikon D40, it being a budget dslr is kind of user friendly.. However, to get a full experience of it, one must still go out of her way to really learn all its features. So bear with me please... But I'm very excited because now i'm flooded with ideas for my blog. I feel like I've completed the circle..
Ladies, this is for you as it is for me because I am now officially gunna give you a more accurate photos of everything.. from FOTDS to swatches.. so watch out for that! You'll get a better look at every product I feature and a look at my ginormous pores! LMAO!